As a small business owner dipping your toe into uncertain Marketing waters, there are a couple of things you need to know before jumping in. Which Marketing channels should you use for example? How do you establish yourself in your niche? When should you create or grow your Marketing team? What return can you expect from each channel? One very important question that often gets overlooked is: how can you track the success of your Marketing activities? There is little use in trying things out after all, if you cannot reliably measure the results. Those of you familiar with Google Analytics will know that it represents the mothership of your website's data. Yet the information provided here, is often diluted and robbed of its true value. In order to keep track the success of your Marketing efforts effectively therefore, you need to use UTM links. What is a UTM link? UTM stands for Urchin tracking module, a weird name which can be traced back to Google's acquisition of Urchin Web Analytics in 2005. The point of UTM links is to enable detailed tracking of your Marketing campaigns in Google Analytics. By using run-of-the-mill links, you will find it tough to differentiate campaigns and struggle to evaluate their success. UTM links on the other hand, allow you to add a number of dimensions to your links which make them easier to track and evaluate. We can forget about the middle column for now. The important thing is to learn the name of the different dimensions (Web interface) and their meanings (description). Source: If you're creating a UTM link for an Email campaign, your source would be "Sendgrid", "Mailjet", "Mailchimp" or whatever provider you use. For an Adwords campaign it would be "Adwords"; or "Facebook" for a Facebook campaign. This field should answer the question: where will visitors be, when they are clicking on this link? 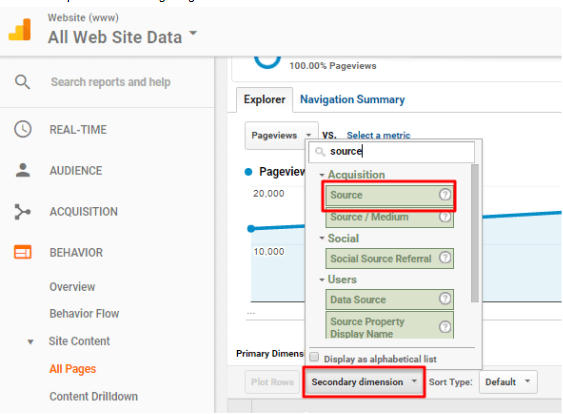 Google Analytics often let's you use Source as a secondary dimension making it one of the most important ones to get right. Campaign: Here we have the third crucial dimension in our UTM buildup. 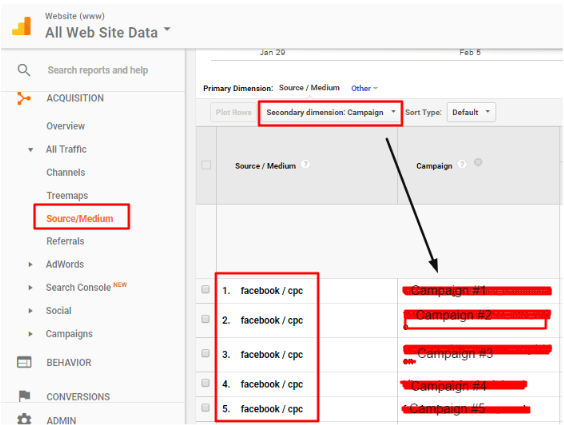 The Campaign dimension will help you differentiate those links which come from the same source and medium. If for example, you plan on running two simultaneous paid Facebook campaigns, the Campaign dimension will allow you to easily track their success in Google Analytics. Now we have covered the three most important dimensions of UTM links. 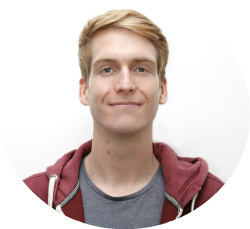 This is all you need to start launching campaigns and evaluating data in Google Analytics. The others are interesting too, but provide a level of granularity which is simply unnecessary for small business owners just getting into Marketing. OK, UTM links are useful! How do we create them? 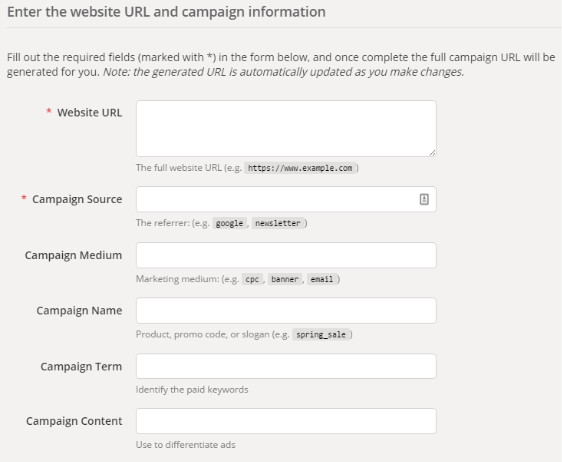 Google has provided a free tool called the Campaign URL Builder. By simply slotting in your preferred parameters, it will create the UTM link for you. The UTM link creation method I recommend however, is to make your own in a spreadsheet. This is just as easy but has the added bonus of keeping a record of the links you have used in the past. 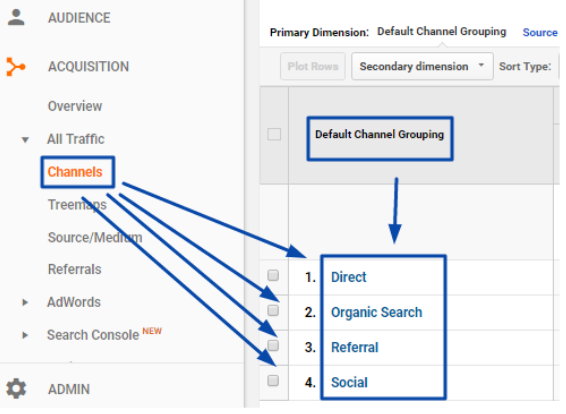 How does Google Analytics group Channels? 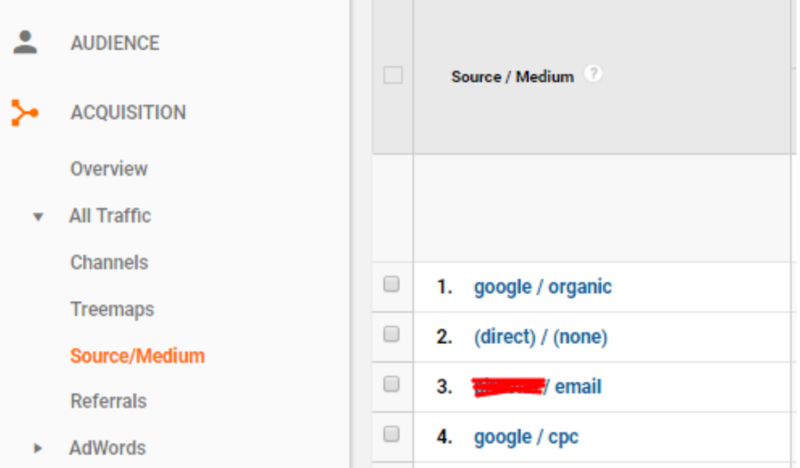 One important aspect of Google Analytics is the composition or grouping of the preset Marketing channels. What do I mean by this? What we can see here, is that you can impact where your link will be grouped by detailing the correct source or medium. Let's look at an example to clarify the importance of this point. You decide to run a Facebook campaign. Naturally you post organic material on your page as well and use unique UTM links for each post. To distinguish your paid and organic Facebook traffic, you would use different mediums. 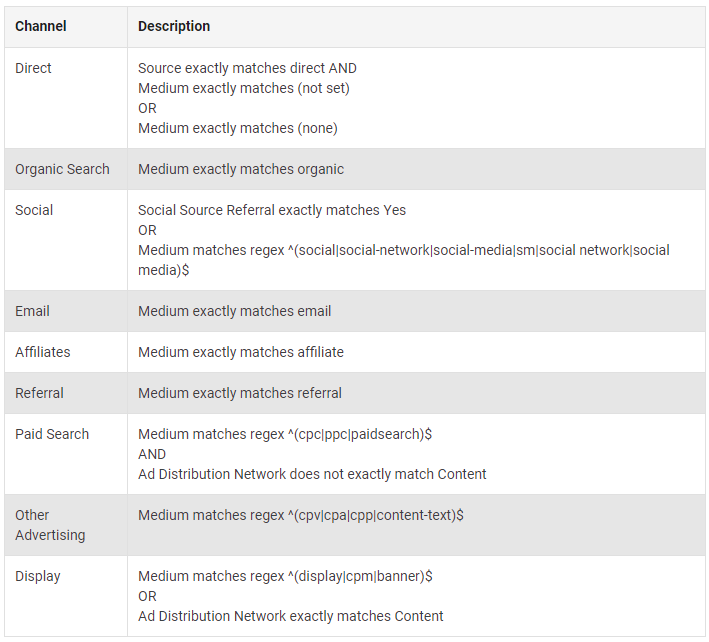 As shown in the screenshot above, the paid Facebook campaign would get the medium: cpc, ppc or paidsearch. For your organic posts however, you would want Google Analytics to group this traffic into your "Social" channel. In order to achieve this, we have to use: social, social-network etc. Doing this will allow you to evaluate campaigns more effectively, and help make custom reporting in Google Analytics more efficient. What Marketing channels should I start off with? Now that you know what a UTM link is and how it can help you track the success of your Marketing efforts, it's worth briefly touching on the best Marketing channels to test on a small budget. While researching new Marketing opportunities, one of your first ports of call should be Search Engine Marketing (SEM) and Social Media Marketing. These channels have the ability to reach thousands of potential customers, and drive highly relevant traffic to your website. This is an impressive figure albeit provided by a clearly biased source. That being said, Adwords (Google's advertising platform) was launched in 2000 and wouldn't have lasted this long if it didn't work for most. Similarly, Facebook ads provide excellent value for money for most small businesses. This comes as a result of the huge audience and the impressive targeting offered on the Social Media platform. Instagram and Twitter are less attractive for most industry's, but worth testing with small amounts if you have the time. By following the steps outlined above, you should be in a great position to track the success of your Marketing efforts using UTM links. Before you get started creating awesome new links, make sure you understand the way Google Analytics groups Channels by mediums and sources. I hope I've done a decent job of outlining this above, but I'm here to answer any questions you may have in the comments.